In the Neighbourhood Plan approved in the recent referendum, Lichfield proposes itself as a "City of Festivals"; meaning that there will be an ever-increasing number of visitors to the city. Whether visitors arrive by bus or by train, they are currently greeted by a scene which fails to impress - a gaping wound where the garage used to be, and a bus station that looks as though it's been due for renovation for at least a decade (which of course it has). For those coming by car, of course, the Birmingham Street car park is another eyesore. Lichfield and Burntwood can't wait for another fifteen years for this area to be developed. There's little point in wringing our hands and pointing fingers (in any case, it's a difficult trick to pull off if you try doing them simultaneously). We need constructive plans which will make the best possible use of the site, to enhance both the life of residents of the area, and the Lichfield experience for visitors. To best achieve this, LibDems believe that any development, no matter what the function of the new buildings may be, must harmonise with the existing older architecture of the town. There is no need for Lichfield to be turned into yet another anonymous Midlands town full of bleak concrete boxes. This does not necessarily mean faux-Georgian or mock Tudor buildings - it is possible to use traditional materials in ways which reflect our age, while complementing such nearby buildings as St. John's Hospital, one of the (often overlooked) gems of Lichfield architecture. But what enhancements will help both local residents and visitors? We have seen the shambles that resulted from the Council's idea of filling so much of the space with yet more national chain stores and a host of coffee shops and restaurants. Most people would agree that low-rise accommodation, centrally located, specifically designed for younger, first-time occupiers, and created in close co-operation with local housing associations, would keep the heart of the city youthful and alive. The Friary leisure centre is rapidly nearing its "best before" date. Perhaps a centrally located leisure centre, designed, as always, to complement the city's unique architecture, is a possibility. 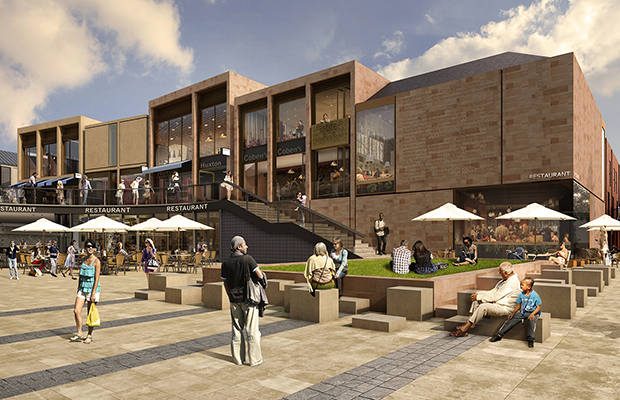 As in the original plans, a cinema could be incorporated into this development (assuming that the old Regal will never revert to its original use), providing a new focus for entertainment for the whole district, not just the city itself. With the move of the library to St Mary's and the loss of the museum, maybe a museum or some other heritage project could be part of the new development - and, dare we dream, funded by the lottery or a similar source? It could also house the tourist information centre - convenient for the bus and rail visitors. And while on the subject of bus stations... I think it goes without saying that something needs to be done. With this mix, or something like it, Lichfield Liberal Democrats believe that the Friarsgate area, rather than being the bomb site wannabee that it currently is, could prove a dynamic and attractive gateway for visitors, as well as being a central focus for residents that keeps the city and surrounding communities alive and healthy.